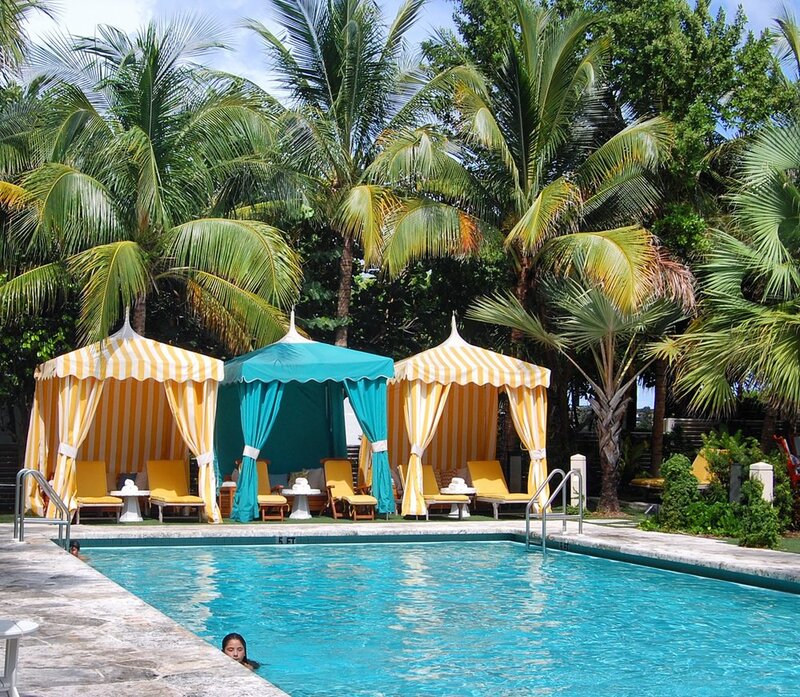 As a curious Miami native thirsty to discover my new weekend go-to or pool hang out, I seize every opportunity to explore the boutique hotel scene. Word on the street was that Hyatt was re-branding an oceanfront property previously owned by Thompson… so of course, I had to check it out. The Confidante is the newest addition to the Unbound Collection by Hyatt – a uniquely curated collection of boutique hotels. Naturally, I got very excited. Why? Because this meant the properties would (hopefully) maintain that high-quality Hyatt hospitality, all while crafting a distinct guest experience with charming design, great menus and a little, shall we say... "umph?" When I stepped into the lobby, I was immediately greeted by every employee I made contact with, which is extremely important in my book. My check-in was friendly and uncomplicated. The chandelier in the lobby is gorgeous. The couches and mirrors were retro with a feminine touch, not overly loud design choices, and all subtle, but unique. In other words, major interior design goals happening here. Jonathan Adler decorates the guestrooms, which are mid-century modern with a “beachy” twist, full of bright accents and minimalist wall hangings. My room was bright, clean and had a great mini-bar selection. Even the guestroom keys and coasters were darling (major brownie points for the details! ), and the overall design is a perfect mix of whimsical and elegant. I spent a good portion of my day by the pool deck, relaxing and spending time with friends. It was one of those environments that had everything you’d need for the day. There were two (heated) pools, one was kid friendly and the other for adults. The pool is lined with bright cabanas that offer a bit of privacy and seclusion if you want to come with a larger party. There was a DJ playing a fabulous selection of minimal lounge music which later was taken over by a seductive South American band.The cocktails and poolside bites were fantastic. I recommend the salmon salad or the fish tacos which both paired nicely with the rose we ordered. I spent a good portion of my day by the pool, relaxing and spending time with friends. It was one of those environments that had everything you’d need for the day – there were two (heated) pools, one kid-friendly and the other for adults. The pool is lined by bright cabanas that offer a bit of privacy and seclusion if you want to come with a larger party. There was a DJ playing a fabulous selection of minimal lounge music, which was later taken over by a seductive South American band. Adding to the scene, the cocktails and poolside bites were also fantastic. I recommend the salmon salad or the fish tacos… they both paired nicely with the rosé we ordered. All in all, the beds were comfy, the rooms were spacious (a feat that’s almost impossible to find on South Beach) and the service was top notch. Would I come back? You bet! Talde: Located on the southwest corner of the hotel, just behind the check-in desk wall, come here for feverish hip-hop playlists and a solid plate of Pad Thai by Chef Dale Talde. The late-night noodle menu is offered until 2am on weekends. Bird and Bone: Chef Richard Hales brings you his famous Nashville spicy, fried chicken and some serious Southern cuisine. Enjoy your meal and cocktails 'al fresco' on the beautiful open-air terrace.